Eve Bain is the Passchendaele Scoiety Youth Ambassador. In 2011 Eve won the “Why Don’t We Remember The Battle of Passchendaele?” multi-media competition. Eve’s entry took the form of a collection letters from a soldier at Passchendaele to his family and won her a $2,000 grant towards her tertiary study. 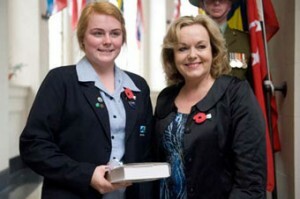 She is seen here with Hon Judith Collins (the then Minister of Veteran Affairs) at the Society’s 12th October 2011 Passchendaele Commemoration Ceremony. Entries for this year’s competition close on 14th September 2012.